We are pleased to announce the winners of the 2018 contest. 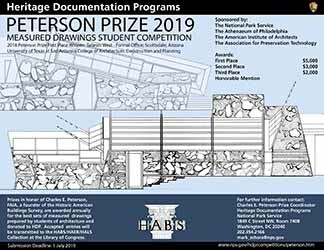 The National Park Service's Heritage Documentation Programs (HDP), The Athenaeum of Philadelphia, the American Institute of Architects (AIA), and the Association for Preservation Technology International (APT) announce the 2019 Charles E. Peterson Prize, which annually recognizes the best set of measured drawings prepared to HDP standards and donated to HDP by students. The prize honors Charles E. Peterson, FAIA, founder of the Historic American Buildings Survey (HABS), and is intended to increase awareness, knowledge, and appreciation of historic buildings, structures, and cultural landscapes throughout the United States while adding to the permanent HABS/HAER/HALS Collection of measured drawings at the Library of Congress. To date, more than 3,000 students from 75 colleges and universities have participated by completing more than 500 entries and almost 6,800 sheets of measured drawings. The students have worked alone and in groups, in required courses, electives, independent study and summer institutes. They have been, for the most part, architecture students in addition to architectural history, interior design, and American studies majors.